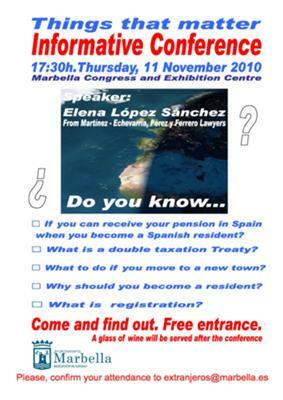 Marbella Town Hall is inviting all foreigners residing in Marbella to an informative conference at the Palacio de Ferias y Congresos in Marbella on November 11th at 5:30pm. * Can you receive your pension in Spain when you become a Spanish resident? * What is a double taxation treaty? * What to do if you move to a new town? * Why should you become a resident? Free entrance! and a glass of wine after the conference.